What a weekend! It was so nice to finally be outside, in the sunshine, without shivering 🙂 I’m so glad that Spring finally decided to show up. With soccer starting on Saturday, I didn’t have a chance to get to the grocery store, so we are eating from the pantry this week. I’ll probably run over to Aldi later in the week to pick up some fresh produce and milk, but other than that, we are pretty much set with items from the freezer and pantry, yea! Looking for more menu inspiration? 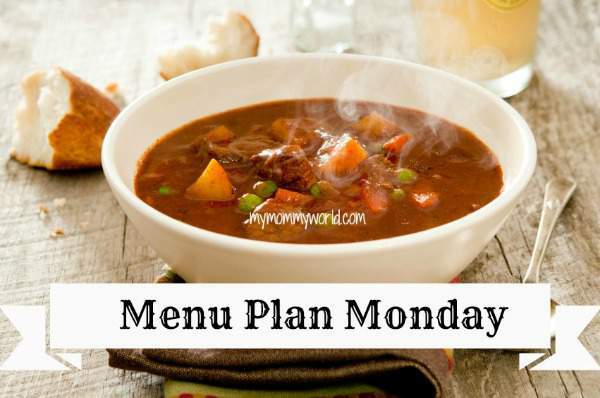 Check out Org Junkie‘s Menu Plan Monday link-up! It’s nice to have enough food in the pantry to eat for a week without shopping. This week I’m trying a few new recipes, one freezer meal I made ahead and a couple other recipes I though up to make. I hope we like them. Glad to hear you finally have gotten some nice spring weather. We have spring around here as well finally. I just hope it stays this time! It is always nice to take a week and eat from the pantry. I went grocery shopping last night because my pantry menu would not have been nearly as nice as your menu. Isn’t breakfast for dinner the greatest? I love it because I can make something really nice that I don’t have time to make on a busy morning.